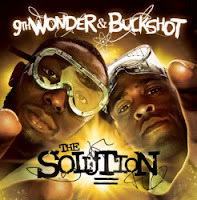 The Solution marks the third time the two have collaborated on an album. Falling in line with time-honored tradition of deejay ‘n’ emcee combos, 9th’s imperturbable boom-bap is complimented favorably by Buck’s clear and concise delivery. And, like his vocal conveyance, Buck’s lyricism is also fairly simplistic in that it’s largely free of allegories and nonsensical word-associations. Although there are plenty of braggadocio rhymes, his most attention-grabbing verses come when he opens up about deeply personal experiences with unfaithful girlfriends and divorce. Overall though, the record’s greatest strength can be attributed to 9th’s production. ...Read entire review here.